Lost password or locked Windows account is the most frequent problem data recovery specialists have to deal with. You could format the hard drive or reinstall your operating system, but that wouldn't keep you from partial loss of data, personal settings and extra headache. Besides, all that can take some time. There is a quicker and more elegant way out of this situation. Just run Reset Windows Passwords from a bootable CD or USB and reset the forgotten password or unlock the account. It's a matter of a few minutes! 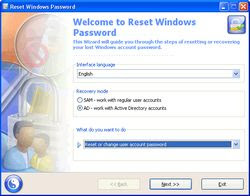 Reset Windows Password is the most powerful solution for recovering or resetting all types of Windows account passwords: user', administrator, Active Directory accounts, and domain administrators. The program is designed specifically for an inexperienced user and is easy to operate. On the other hand, the password lookup algorithms are unique and not used in any similar application. Unlike other utilities, Reset Windows Password is the only program that can CORRECTLY process all types of Windows accounts. • Simple, intuitive graphic interface. No more ugly DOS prompts. • Resets and modifies passwords of local users and administrators, domain administrator, Active Directory users, DSRM account. • Advanced password lookup algorithms (also known as AI attack). • Dumps user password hashes from SAM for further analysis. • Dumps password hashes from Active Directory. • Dumps domain cached credentials. • Supports all versions of NT-based Windows, including the newest Windows 7. • Supports non-English versions of Windows and passwords in national encodings.